There are 100’s of fitness trackers available in the market. Choosing the best fitness/activity tracker is not someone’s cup of tea. Brands like Fitbit, Garmin, Samsung, Xiaomi have launched 10’s of versions of fitness trackers in the market in the last few years. The best fitness trackers are now a need of hour for people who want to stay fit and healthy. As the wearable technology getting developed, these fitness trackers are more and more feature rich, compact and trendy. They are becoming affordable to people. It’s not just pedometer that the fitness trackers are tracking, they are also monitoring your heart rate, sports activity, sleep activity, GPS tracking and also your stress points. Choosing the right fitness tracker is totally up to an individual and their choices. Some people just want it for step counting while others for heart rate activity, while others want it for intense fitness and sports activities. Few people would look for options like GPS as well while others may not. There is a very thin line between a Fitness Tracker and a smartwatch. We’ve selected the list of top rated fitness trackers for January 2019 that you need to check out right now. Let’s have a look at our top fitness trackers below. There is buyer’s guide as well at the end of the review. One of the most heavily fueled products by one of my favorite fitness tracking brand Fitbit is none other than the FitBit Ionic. The Fitbit Ionic can track everything that you do such as your running, swimming, riding, workouts, day to day activities, sleep activity, stress and recovery. You can start your personalized workouts pretty easily. Fitbit Ionic has a built-in GPS (GLONASS) that will track your speed, distance, paths, heart-beat tracking and real time zones. Moreover, the Ionic can store and play over 300 songs. As if this was not enough you can even download playlists from Pandora. With the Ionic tracker you can access your favorite apps in sports, weather, manage your payments and many more all with the help of an NFC chip. The touchscreen is really good and sensitive. It is a corning gorilla glass 3 which is really good,durable and damage resistant. The Fitbit Ionic comes with 8 different sensors while the frame itself has an integrated antenna which helps to get strong satellite signal. It is water resistant up to 50M level and has a battery life of 5 days, although it may vary depending on the usage. The build quality is really good and strong yet it is lightweight (aerospace grade aluminium). The Hi-Responsive touchscreen comes with increased numbers of pixels. The Fibit Ionic tracker has smart notifications which helps you to stay connected with calls, texts and calendar notifications. Sensors include Altimeter, Accelerometer, gyroscope, GPS, Optical heart-rate monitor, Ambient light sensor, etc. 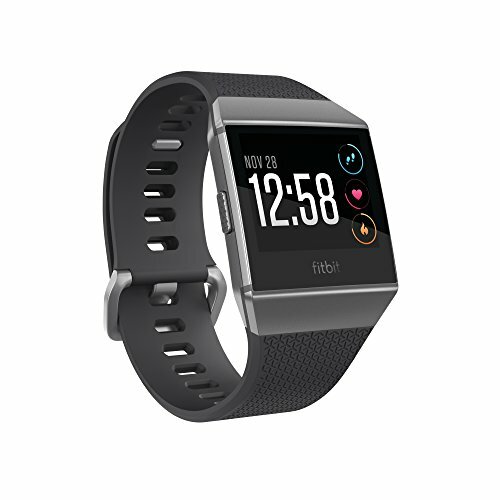 Fitbit Ionic will sync automatically and wirelessly with computers and 200+ leading iOS, Android & Windows devices using Bluetooth 4.0 wireless technology. One of the leading and renowned manufacturers in the sports and fitness tracking market, Suunto is in our list of best fitness trackers. The Suunto 3 Fitness tracker stays active and comes with personalized and adaptive training guidance so that you can maintain your health and wellbeing 24/7. This fitness tracker is fueled with all the activity tracking you have heard of including sleep quality, stress and recovery. Suunto 3 Fitness is beautifully designed and durable fitness tracker or rather say it as Fitness watch. It has number of smart features that helps you being active in your lifestyle. The tracker creates a personal training plan which will adapt to your fitness needs and values. What is even more interesting is the real-time guidance it provides while you are exercising. The Suunto 3 Fitness will track your activity like steps, calories and sleep for 24/7 along with the stress and recovery monitoring. The key features include adaptive training guidance, sleep quality tracking and integrated GPS. Suunto 3 Fitness tracker is water resistant up to 30M. The Glass material used is Polyamide which although are tough but are light weight and the bezel material is stainless steel. The tracker uses Bluetooth Smart connectivity and most of the smartphone models are supported. You will get phone app notifications using Suunto App. Battery life is extremely good and with 24/7 tracking and notifications can stay up to 5 days while in training mode (with connected GPS) stays alive up to 30 hr. 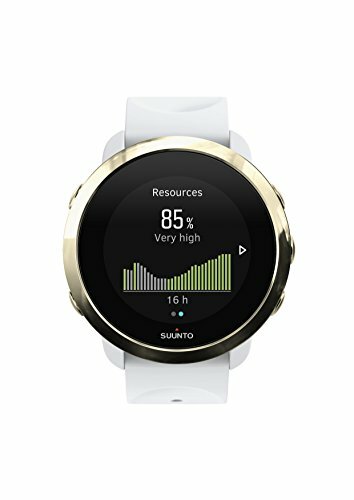 While Suunto 3 Fitness has lots of tracking features; the sleep tracking, stress & recovery tracking and resource levels are some of my favorites. The adaptive training guidance is something to look out for. You can pick the one that matches your goal and boost your fitness plan. Suunto 3 Fitness creates a 7-day training plan for you with optimal duration and intensity for each exercise. As I said earlier, Suunto is into Sports and Fitness tracking for a long time now hence the Suunto 3 Fitness is actually ready for all sports such as running, swimming, cycling, hiking and many more. Suunto 3 Fitness automatically counts your daily steps and calories. But to balance activity, a good night’s sleep is essential. Wear Suunto 3 Fitness at night to track your sleep too. In the sleep summary, you’ll see how long you slept, and how well your sleep supports recovery. Additionally, the watch measures your stress and recovery throughout the day to help you ensure you have enough in the tank to make it through the day. Suunto 3 Fitness connects to the Suunto app which logs all your activities and keeps you up to date. The Fitbit Versa is one of the intuitive and approachable health and fitness smartwatch. 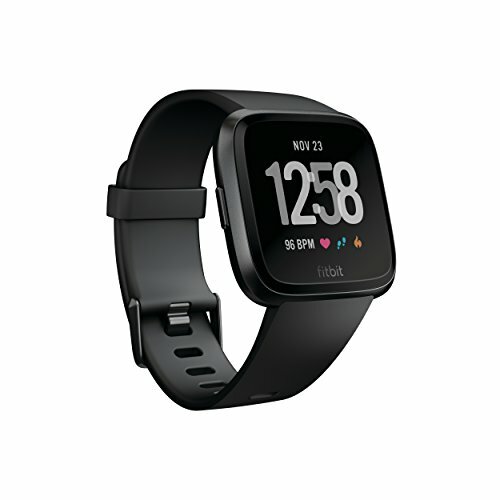 Fitbit Versa tracker helps you to track your fitness and sleep tracking, heart-rate tracking. The Versa comes with Apps, Music & Notifications an has long battery life. Fitbit Versa is Swimproof* and comes with a personal coaching. The Fitbit Versa is for the extreme fitness enthusiasts and tracks every activity that might use. From water to workouts, see all your stats in your Fitbit dashboard. You can set your goals and progress based on the stats. Versa tracks your sleep activity and monitor your sleep stages. For ladies, you can enable Female Health Tracking to log periods, keep track of your cycle and gauge ovulation. With Guided Breathing Session, you can have your moments of calm for a good breathing session which are personalized based on your heart rate activity. With PurePulse Heart Rate you can track your heart rate zones during workouts. The Fitbit Versa comes with 15+ exercise modes which you can use for swimming, running and others to see your real time stats while you are exercising. Versa is integrated with GPS. Just like Ionic, with Versa, you can store and play up to 300 songs and download playlists from Pandora. You will get call, calendar, text and app alerts and can send quick replies to the messages. This is to be noted that this feature is available for Android only. Moreover it doesn’t come with GPS support as well. Guided workouts with Fitbit Coach. Comes with Female health tracking. 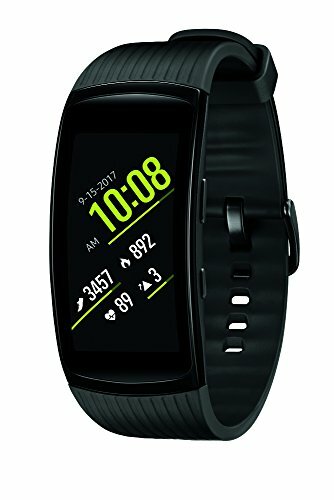 If you are looking for a good alternative to the Fitbit’s Ionic, Samsung Gear Fit2 Pro would be an apt choice for you. The Gear Fit2 Pro comes with fitness tracker and smartwatch feature. It is one of the best tracker for swimmers as it is water resistant up to 5 ATM*. The Speedo On app which is specifically developed for Gear Fit2 Pro will track your stats and display them in summaries. However the availability of the Speedo On app for Gear Fit2 Pro may vary by country and region. The Gear Fit2 Pro has water resistance rating of about 50 meters under the ISO standards of 22810:2010. It comes with the premium configurations from UA Record (World’s first 24/7 connected health and fitness system), MapMyRun, MyFitnessPal(easy to use calorie counter with access to over 500,000 food choices), and Endomondo. No matter what your activity is, the Gear Fit2 Pro will detect and track all your activity. The Samsung Gear Fit2 Pro also monitors your heart-rate throughout the day picking up your heart rate zones so that you can track and make good fitness decisions. The fitness tracker comes with built-in GPS to log your workout records and track your locations. Your favorite music app Spotify will help you listen to the music via Wi-Fi even in the offline mode. The Gear Fit2 Pro can be customized according to your needs. This includes having access to over 3000 apps and watch faces to choose from. Apart from running a full spectrum GPS, the touch panel is 1.5″ curved sAMOLED. The sensors include accelerometer, barometer, gyrosensor and HR sensor. Moving over to the question on “What’s the battery life?” Well, the Gear Fit2 Pro comes with a battery capacity of 200mAh and has a typical usage time of approximately 4 days. With full GPS usage, it stays alive for 9 hours. 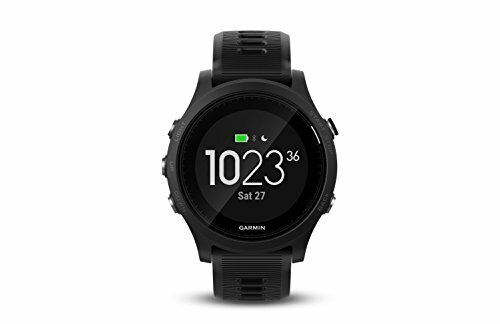 The Garmin has been the brand of at most respect in the field of fitness and activity tracking along with the smartwatches. With Garmin’s Vivosmart HR, you will be able to track your wellness and fitness activity while flaunting your style. The Vivosmart HR activity tracker is extremely beautiful, slim and stylish with easy to read display. The sleek design of the band is very comfortable to wear and the always-on display shows your stats every time. It displays stats such as steps, distance, calories, heart rate, floors climbed, activities. It also gets text, call, email, calendar and social media alerts. The vívosmart HR activity tracker automatically syncs with your smartphone throughout the day. In addition to all these tracking, vívosmart HR also measures floors climbed with the help of its integrated barometric altimeter. Coming to the hardware, the touchscreen lens is acrylic material and the strap is silicone. The display resolution is 160×68 pixels which is good. Some of the features include Bluetooth Smart connectivity, Smart notifications, VIRB Camera remote, HR features such as HR zones and broadcasts. Fitbit’s claims that their latest fitness tracker Charge 3 is the most advanced fitness tracker under the brand. The Charge 3 helps you understand your body and fitness activity and help you improve your health and wellbeing. It is beautifully crafted and has support for 24/7 heart rate and goal-based exercises. The Charge3 is swimproof and it is water resistant up to 50M. It has smartphone notifications feature. The best part about Charge 3 is the battery which is about 7 days. With the 24/7 heart rate tracking you can better understand your health trends and HR zones which is real-time. It also tracks your all day calorie burn and 15+ exercise modes like running, biking, swimming, yoga, circuit training and many more and all these are recognized automatically. It can be connected with our phone GPS to help you see your pace and distance during outdoor runs and rides. The fitness tracker is also a good choice for females to track periods, log symptoms, see ovulation calendar and many more. The sensors include 3-axis accelerometer, Optical heart rate monitor, Altimeter, Vibration motor, Relative SpO2 sensor, NFC (in special editions only). The Charge 3 comes with variety of accessories and bands along with number of clock faces. It automatically syncs to computers and over 200 Android and iOS devices. The Charge 3 is extremely lightweight as like Ionic, it also comes with aerospace-grade aluminum material and strong corning Gorilla Glass3. The Garmin Vivomove HR is one of the coolest hybrid smartwatch with hidden touchscreen display and real watch hands. 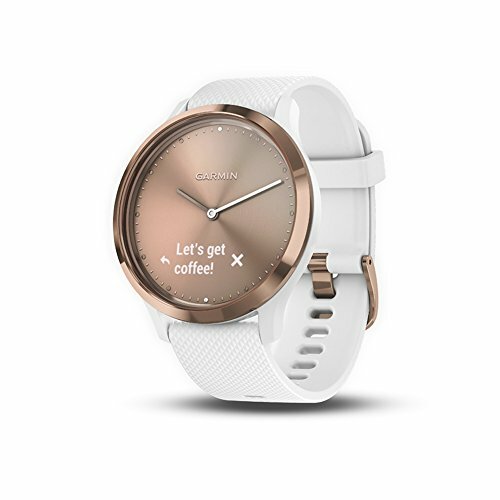 With smart features and connectivity, the Garmin Vivomove HR is also loaded with features like music control, smart notifications, reminders, 24/7 heart rate monitoring, stress tracking and relaxation timer, sleep monitoring. The Vivomove HR’s battery life is really good which is about 5 days in smart mode and up to 2 weeks in watch mode. The Vivomove stays fashionable has features of a touchscreen with hidden display. The watch hands show the time but move away when you make a swipe on your messages, heart rate² and more. The Garmin Vivomove HR can count your steps and calories along with stress tracking and advanced sleep monitoring. With Vivomove HR you can stay active while being fashionable and look trendy. The smart display will only appear when you turn your wrist to glance at your watch. The watch hands will dynamically move out of the way when you interact with the touchscreen then move back to the correct time when you are done. Along with the basic activities that most fitness trackers do, the vívomove HR uses heart rate to provide calories burned information along with the intensity. The lens material is chemically strengthened glass with bezel material as stainless steel. If you are seeing Garmin and Fitbit more in this list of top 10 fitness trackers, it’s because they are one step ahead of other fitness tracking brands. Garmin’s Forerunner 935 is the one that most athletes would love to own. The Forerunner 935 is loaded with premium GPS and Triathlon watch. It features advanced running and multi-sport features and has weight just over 49 grams. The Forerunner tracks your elevation changes with the help of built in barometer, altimeter and electronic compass. Believe or not, the Forerunner is extremely smart and will evaluate your training status. Whether you are under-training or overdoing, the Forerunner 935 will log every record of your activities. The Forerunner 935 will log your running metrics² which will help you to analyze your performance. It will also track data like cadence, stride length, ground contact time and balance, oscillation and vertical ratio. Above all, the Forerunner 935 is loaded with built-in profiles for running , cycling , swimming (pool/open water),skiing, paddle sports, trail running, hiking, strength training and many more. The fitness tracker provides advanced dynamics² for your runs, cycling, swims, and much more. The Forerunner gives a lot of data about your running dynamics, heart-rate(wrist based), training status, FTP and VO2 max. The battery life is good at 2 weeks with a single charge and stays up to 24 hours in full GPS mode. The Forerunner is beautifully designed and extremely lightweight and fits comfortably in your wrist. The lens material is chemically strengthened glass and the bezel is a fiber-reinforced polymer which is really good quality. There are options to change bands with your liking. The display size is 1.2″ giving you a resolution of 240×240 color display. The Sensors include GPS(GLONASS), wrist heart rate monitor, Barometric altimeter, Compass, Gyroscope, Accelerometer, Thermometer. Talking about connectivity, the Forerunner connects to your devices via Garmin Connect and uses Bluetooth Smart, ANT+ or Wi-Fi. The Forerunner 935 will track your steps, runs, swims, inactivity, sleep monitoring, calories,floors climber, distance traveled, intensity minutes, heart rate, stress and recovery; along with number of features and data. Ground contact time and balance (shows how much time, in the running motion, your foot is on the ground rather than in flight and lets you check your running symmetry). The Forerunner 935 is neat activity tracker while you are hiking, climbing, skiing, snowboarding, XC Skiing, paddleboarding, rowing etc. 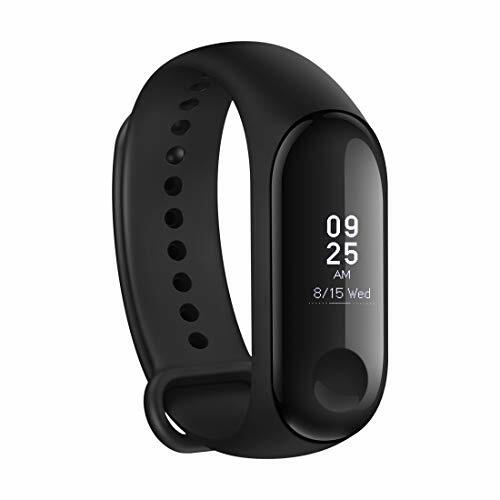 Xiaomi’s Mi Fitness Band has progressed really well in the last few years and they are probably the most preferred choice for people who are budget conscious. The budget friendly tracker comes under $50. The Mi Band is one of the most sold and popular product from Xiaomi. The Mi Band 3 comes with a larger OLED screen, better HR tracking, lots of additional features and water resistance up to 50 meters. The Chinese manufacturer offers heart rate monitoring and various tracking options with one-third the price of most fitness trackers available in the market. The Xiaomi is the second largest manufacturer of fitness trackers in the world. In the first quarter of 2018, Xiaomi has sold more than 3.7 million Mi Bands (including more than 1 million Mi 3 Band). Xiaomi Mi Band 3 comes with all the basic features to measure daily activity, your sleep activity, along with the mirror notifications from your phone to your wrist. The OLED panel provides the resolution of 128×80 and is able to fit lots of updates and information like notifications and weather updates on the screen. Comparatively the touchscreen isn’t much responsive to the touch as you can see with Fitbit and Garmin. Probably the con you would have to accept if you are tight on your budget. However, because of it’s larger display you will be able to scroll through various screens, track activity, weather information, and notifications. The Mi Band 3 also features lots of watch faces. There is a button you will find at the bottom of the panel which let you go to the home screen. The Band will log your heart rate and you can trigger the measurements by long pressing the button. The Mi Fit app is loaded with only basic features that will help you view all your activity, calories details and sleep tracking. It has the battery of 110mAh and can stay alive for two weeks before being recharged. As with all this features, comes the part when the question comes about the quality and refinement. It will be tough to view the display in the outdoor unless you cover a little with your hand. Brightness that’s what we are talking about. The other thing which I didn’t liked about the Mi Band 3 was it’s accuracy. There were differences in both steps activity as well as the HR tracking. The Mi Band 3 send you reminders throughout the day and you can customize your inactivity reminders as well. The Mi Band 3 does a wonderful job with lots of features under this price. Of course you won’t find the accuracy and quality compared to the Fitbit and Garmin, but you shouldn’t bother much about it because you are only getting the value for the money. The Mi Band fitness band is manufactured by Huami, which is the same company which makes Amazfit smartwatches. 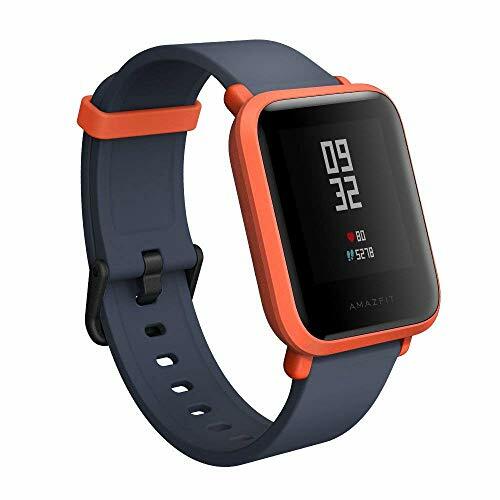 The Amazfit Bip comes with lots of great and exciting features and is a value for money product. The Amazfit Bip is beautifully designed and gives comfortable fit. It is made out of polycarbonate with a 2.5D curved display backed by Gorilla Glass 3 layer. There are many color options to choose your bands. The Amazfit fitness tracker has 1.28 inch display and features the resolution of 176×176. The display however looks okay for the price tag. The Amazfit Bip dons a good HR sensor and comes with a built-in GPS. The fitness tracker is dust and water resistance and has an incredible battery life of 30 days. By looks of it, the design may make you think about Pebble, but Amazfit Bip has lot to share. The Amazfit Bip fitness tracker is extremely light-weight and is a beautiful crafted. If that’s not enough, the Bip will seamlessly connect to your Xiaomi’s Mi Fit app for notifications and tracking daily activity. There aren’t much options with third-party apps but you can choose certain options that comes from Mi Fit. The built-in GPS accurately map and tracks your daily activities like walking, cycling, running. However, you will have to manually enable the workout from within the watch. Though the Bip comes with IP68 rating, it still lacks swimming tracking which is kind of confusing. What is really keeping the Bip ahead from most of the fitness trackers is the battery life. As per the Amazfit, the Bip has a battery life of 30 days on a single charge. Just like Xiaomi’s Mi Band 3, Amazfit Bip also dons mirror notifications on your wrist. The Amazfit Bip comes with a reflective always-on touch display, built-in GPS, barometer, geomagnetic sensor, PPG heart rate sensor, 3-axis accelerometer for activity tracking, sports and sleep tracking. With all these sensors and features, the Amazfit Bip only weights around 31 grams. The Bip fitness tracker will help you track your activities both indoor and outdoor, cycling and other sports along with GPS routes and stats. The sleep tracking sensor will analyze your sleep patterns very well such as measures like light sleep, awake times, deep sleep and such. While our list for best fitness tracker is complete, I would like to add Moov Now which deserves some attention and respectfully so. The Moov Now is the compact, lightweight activity tracker which will track your activities like circuit training, running, cycling, swimming, cardio boxing, treadmill run, open tracking. It weighs only around 15.1 grams and dons Omni Motion sensor which provides your real-time accuracy. This compact fitness tracker also monitors your heart rate, HR Sweat and measures your sleep analysis. When it comes to the battery life, no fitness tracker matches it. The Moov Now battery will stay alive for 6 months with a single charge. The best fitness tracker or smartwatch is the one which does the job. The job that’s worth the price for fitness enthusiasts. In the January 2019 list of best fitness trackers, you will find at least one fitness tracker that will keep you activated with no compromises. As already said above, there is very thin line between a fitness tracker and a smartwatch due to the advancing of wearable technology. Here is our buyer’s guide for best fitness trackers available right now. Here is the list of best fitness activity trackers from the brands like Fitbit, Garmin, Suunto, Samsung, Xiaomi and more. Best Fitness Trackers for the month of January 2019.